Download "Domestic Violence. (b) Assaulting, attacking, beating, molesting, or wounding a named individual." 1 Domestic Violence Domestic Violence is one of the 12 factors of the best interests test set forth at MCLA The best interest factors were modified in 1993 to include domestic violence as factor (k). Factor (k) includes [d]omestic violence, regardless of whether the violence was directed against or witnessed by the child. Prior to 1993, the courts wrestled with whether to consider domestic violence as a factor in a custody case if the alleged violence was not witnessed by the child. In the end, the Legislature recognized that being a victim of domestic violence compromises a person s ability to parent because of the depression, fear, and anxiety that normally results. In 1994, the Legislature adopted the current personal protection order statutes. There statute regarding PPO s that is set forth in MCLA is intended for people presently or formerly in a romantic relationship, and MCLA a is intended for people who need protection but never had a romantic relationship to each other. MCLA provides, in part, as follows: (1) Except as provided in subsections (27) and (28), by commencing an independent action to obtain relief under this section, by joining a claim to an action, or by filing a motion in an action in which the petitioner and the individual to be restrained or enjoined are parties, an individual may petition the family division of circuit court to enter a personal protection order to restrain or enjoin a spouse, a former spouse, an individual with whom he or she has had a child in common, an individual with whom he or she has or has had a dating relationship, or an individual residing or having resided in the same household as the petitioner from doing 1 or more of the following: (a) Entering onto premises. (b) Assaulting, attacking, beating, molesting, or wounding a named individual. (c) Threatening to kill or physically injure a named individual. (d) Removing minor children from the individual having legal custody of the children, except as otherwise authorized by a custody or parenting time order issued by a court of competent jurisdiction. (e) Purchasing or possessing a firearm. 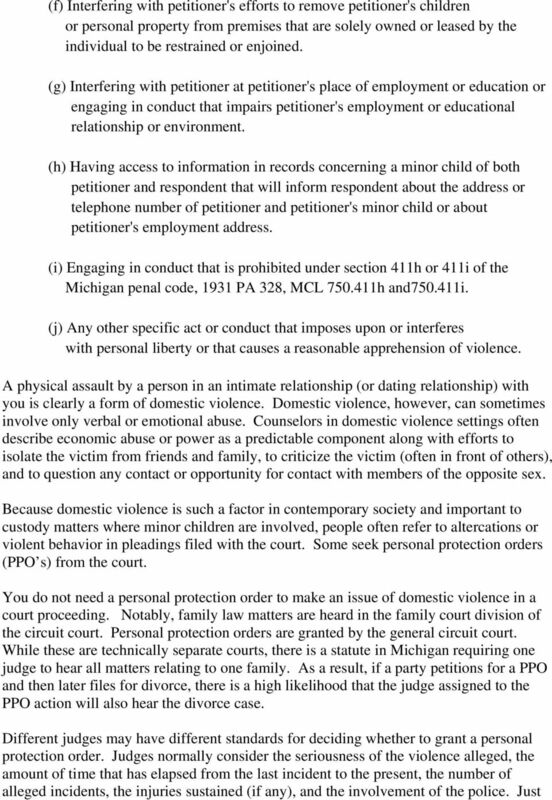 3 as a PPO is not a prerequisite to raising the issue of domestic violence in a custody proceeding, police involvement is also not a prerequisite for obtaining a PPO. 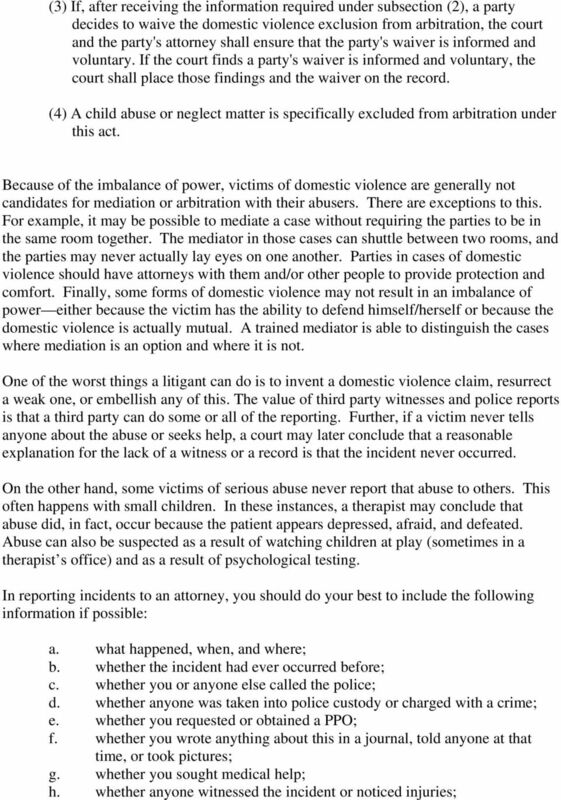 Some attorneys always raise the issue of domestic violence in pleadings if any of it occurred no matter how remote in time. Other attorneys feel that it may be a mistake to make an issue out of something that happened a long time ago and is unlikely to recur, especially if it did not result in major injury to the victim. This is a matter of judgment. The attorneys who are reluctant to raise the issue often fear that the issue itself may poison the waters for any mediation and may re-open old wounds. A therapist asked to evaluate a case for the court may have a completely different point of view. He/she may be troubled by the fact that a person remained in a relationship after repeated abuse and did not see a way out. He/she may worry that an abused parent does not (or did not) have the capacity to protect children from this environment and may therefore expose children to risk in the future. Additionally, some people s relationship histories reveal a tendency to engage with abusive partners repeatedly. Further, research shows that people who are exposed to domestic violence in their childhoods may come to view it as normal and therefore abuse partners themselves as adults or tolerate abuse from others. This outcome is the reason many therapists urge parents in an abusive relationship to view their participation in that relationship from their children s point of view. During a divorce action or a contested custody action, the courts often consider a referral to mediation or may actually order the parties to participate in mediation. Mediators do not want to use mediation in cases where there is an imbalance of power or where one person is seriously worried about his/her safety around the other person. 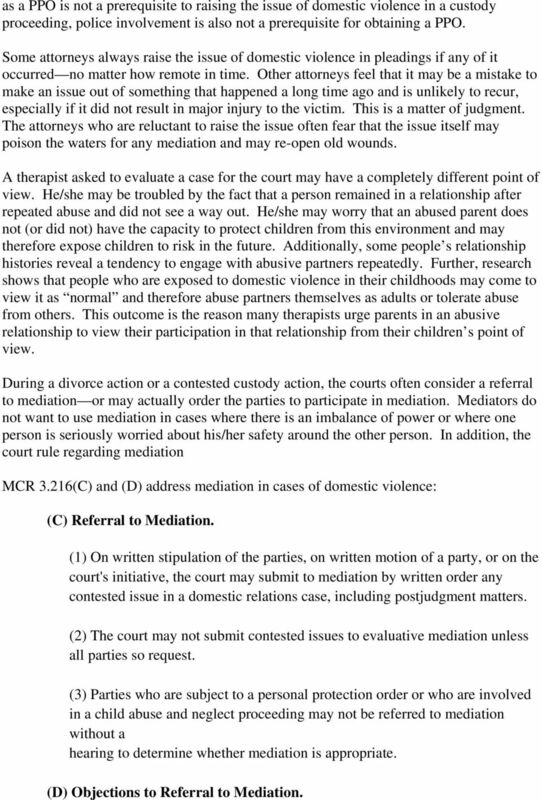 In addition, the court rule regarding mediation MCR 3.216(C) and (D) address mediation in cases of domestic violence: (C) Referral to Mediation. (1) On written stipulation of the parties, on written motion of a party, or on the court's initiative, the court may submit to mediation by written order any contested issue in a domestic relations case, including postjudgment matters. (2) The court may not submit contested issues to evaluative mediation unless all parties so request. (3) Parties who are subject to a personal protection order or who are involved in a child abuse and neglect proceeding may not be referred to mediation without a hearing to determine whether mediation is appropriate. (D) Objections to Referral to Mediation. 4 (1) To object to mediation, a party must file a written motion to remove the case from mediation and a notice of hearing of the motion, and serve a copy on the attorneys of record within 14 days after receiving notice of the order assigning the action to mediation. The motion must be set for hearing within 14 days after it is filed, unless the hearing is adjourned by agreement of counsel or unless the court orders otherwise. (2) A timely motion must be heard before the case is mediated. 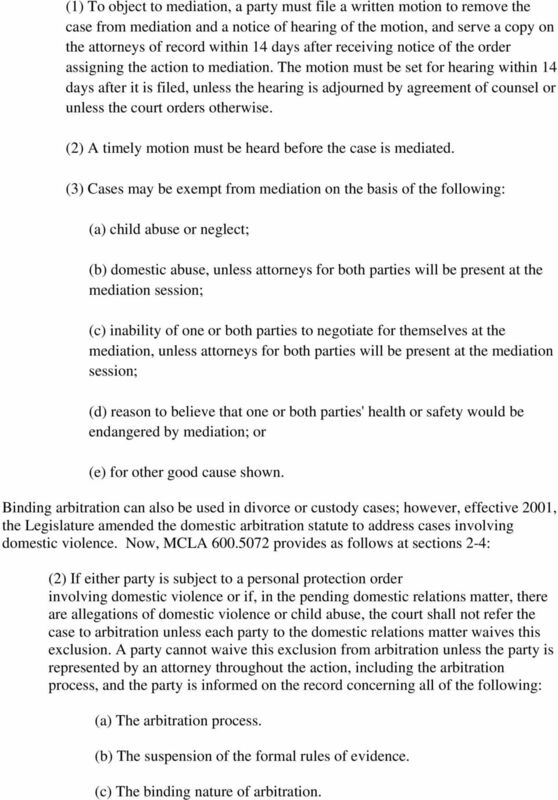 (3) Cases may be exempt from mediation on the basis of the following: (a) child abuse or neglect; (b) domestic abuse, unless attorneys for both parties will be present at the mediation session; (c) inability of one or both parties to negotiate for themselves at the mediation, unless attorneys for both parties will be present at the mediation session; (d) reason to believe that one or both parties' health or safety would be endangered by mediation; or (e) for other good cause shown. Binding arbitration can also be used in divorce or custody cases; however, effective 2001, the Legislature amended the domestic arbitration statute to address cases involving domestic violence. 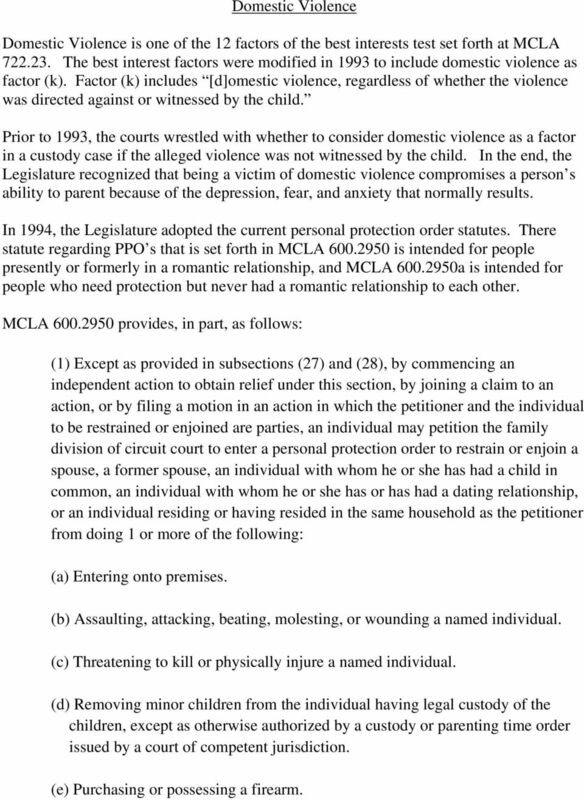 Now, MCLA provides as follows at sections 2-4: (2) If either party is subject to a personal protection order involving domestic violence or if, in the pending domestic relations matter, there are allegations of domestic violence or child abuse, the court shall not refer the case to arbitration unless each party to the domestic relations matter waives this exclusion. A party cannot waive this exclusion from arbitration unless the party is represented by an attorney throughout the action, including the arbitration process, and the party is informed on the record concerning all of the following: (a) The arbitration process. (b) The suspension of the formal rules of evidence. (c) The binding nature of arbitration. 6 i. whether you received any injuries and whether scars or permanent injury resulted; j. whether you (or the abuser) sought any counseling as a result (including anger management classes); k. whether you separated from the abuser at the time, even if only temporarily; l. whether other domestic violence occurred subsequently; m. whether drugs or alcohol played a role in the incident and whether the abuser is still using drugs or alcohol; n. whether you were threatened by the abuser if you told anyone about the abuse; o. whether a weapon was used or threatened during the incident; p. whether you lied to a person investigating the abuse or asking you about it (and if so, what you said); q. whether you are aware of other victims of this abuser. Domestic violence is serious business. Many prosecutors apply a zero tolerance policy to prosecution of domestic assaults. Many judges will not accept plea agreements. If you believe you have a domestic violence issue in a custody case, you must discuss the matter with your attorney so that you can decide together what to do. You must be sure to tell the truth when it comes to domestic violence. If a court concludes that you are asserting a false claim, it can have serious consequences on your case. False claims also marginalize other claims, not only for you but for others. You must also remember that domestic violence is only one of 12 factors. It is not the only one. Under the law, the judge decides what weight to give each factor. If domestic violence has been serious and sustained, it might be given more weight than any of the other factors. On the other hand, if the domestic violence occurred years ago and the abuser did not repeat the offense and/or received counseling, the court may not assign much weight to the issue at all. Most experienced attorneys can have a meaningful discussion of this matter with you and together you can decide what course of action to take in your case. Evidentiary Issues in Domestic Cases: An Overview Introduction A. 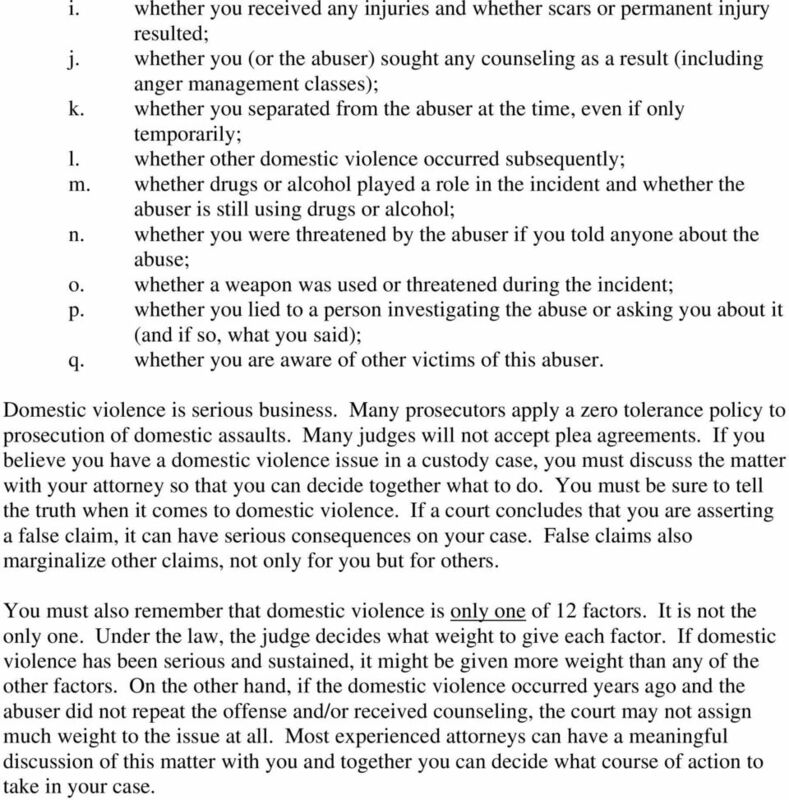 Importance of legal representation in cases that involve domestic violence. B. History of protection order laws and implications for evidence. THE BASICS Custody and Visitation in New York State This booklet answers common questions about custody and visitation when the parents cannot agree about who is responsible for taking care of the children. The Family Law Process: Highway to Hell or Road to Resolution? APPENDIX B. ASSESSMENT OF RISK POSED TO CHILDREN BY DOMESTIC VIOLENCE Anne L. Ganley, Ph.D.
NEW JERSEY FAMILY COLLABORATIVE LAW ACT. An Act concerning family collaborative law and supplementing Title 2A of the New Jersey Statutes.